What can Tourabout Adelaide offer? "South Australia with the personal touch". TOURABOUT ADELAIDE for the "BEST OF SOUTH AUSTRALIA"
Tourabout Adelaide's guides are wonderful ambassadors for South Australia. 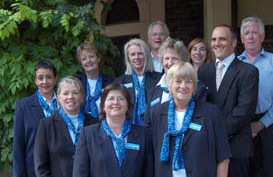 Tourabout Adelaide offers a wide range of informative, relaxed tours for the discerning traveller. Who works for Tourabout Adelaide? Bi-lingual Guides fluent in European languages. All the team are "locals" who can give visitors a personal insight into the Australian lifestyle. English-speaking Guides to give that all important local knowledge to enhance the visitor's stay. Specialist Guides with expert knowledge in particular fields of interest including Heritage Architecture, Wine and Food, the Arts, Bushwalking, Birdwatching, the Environment and Technical Services. Driver/Guide Services for F.I.T. 's - a personalised tour that introduces visitors to Adelaide and has the flexibility to include their interests. Step on guides for Coach Groups - have a knowledgeable local guide to unfold the Secrets of Adelaide to your clients, by providing an informative commentary. Tourabout Adelaide gives you South Australia with a personal touch!